FILE - The remains of buildings line a street that was damaged last summer during fighting between U.S.-backed Syrian Democratic Forces fighters and Islamic State militants, in Raqqa, Syria, April 5, 2018. The U.S.-led coalition battling Islamic State in Iraq and Syria has strongly criticized a report by human rights group Amnesty International accusing it of violating international law last year. The 70-page report said there was "prima facie evidence that several coalition attacks, which killed and injured civilians, violated international humanitarian law" by not taking the precautions needed to minimize harm to civilians in during the months-long battle for Raqqa, Syria. Amnesty investigated 42 airstrike locations, reviewed satellite imagery, and interviewed 112 witnesses and survivors during the last few months of the battle, and it documented the stories of four families. Speaking Tuesday from Baghdad, coalition spokesman U.S. Army Colonel Thomas Veale told reporters at the Pentagon that the coalition adheres "to a meticulous targeting and strike process that always aims to minimize harm to noncombatants and civilian infrastructure." "They [Amnesty International activists] are literally judging us guilty until proven innocent. That's a bold rhetorical move by an organization that fails to check the public record or consult the accused," Veale said. Veale pointed to Amnesty's recommendation that the coalition must cancel a strike if deemed indiscriminate or disproportionate, noting that last year, U.S. Air Force Brigadier General Matthew Isler provided reporters with a "specific example of a canceled strike for those reasons" during a press briefing. He said the coalition was transparent in its processes and accountability, providing weekly strike logs and monthly civilian casualty statements, and that it would use Amnesty's data as a part of a re-evaluation of the strikes highlighted in the report. "As I speak, people are looking at that article and trying to correlate those claims to the strike log and how the battle of Raqqa unfolded as our participation went in it, and so that will continue to be evaluated," he said. FILE - Members of the U.S.-backed Syrian Democratic Forces (SDF) dance a traditional Syrian 'Dabka" as they celebrate in front of stadium that was the site of Islamic State fighters' last stand in the city of Raqqa, Syria, Oct. 20, 2017. "What Amnesty International researchers did is they went into the city, interviewed people and found four specific families who lost dozens of their members in airstrikes, so they would have a better sense of what the experience was like for people living there," Daphne Eviatar, director of security with human rights at Amnesty International USA, told VOA. The "war of annihilation" against IS began when U.S. Defense Secretary Jim Mattis announced the acceleration of operations against the militant group in May 2017. "Our intention is that the foreign fighters do not survive the fight to return home to North Africa, to Europe, to America, to Asia, to Africa. We are not going to allow them to do so. We are going to stop them there and take apart the caliphate," Mattis said at the time. 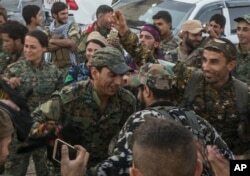 The battle to liberate Raqqa, code-named the Wrath of Euphrates, started in June 2017 and ended with the city's recapture in October, with U.S.-led coalition airstrikes and Syrian Democratic Forces (SDF) on the ground. Coalition forces in Iraq and Syria freed about 7.7 million people and 98 percent of the area previously controlled by IS, the coalition said in April. Amnesty International described the city during the fighting as a deadly labyrinth trapping civilians trying to flee. The group says Islamic State militants used civilians as human shields, preventing many from leaving the city. The Hashish family was among four interviewed by Amnesty. Munira Hashish lost 18 members of her family between July and August 2018. She told Amnesty researchers that when they tried to escape the city, IS militants arrested them and forced them to stay. "About five days after Eid [June 30-July 1, 2017], we tried to flee across the river, but Daesh [Arabic acronym for IS] caught us. They beat the men very badly and detained me and the other women in a house for a day before they let us go," Hashish told Amnesty. As the effort to liberate the city ramped up, so did the numbers of civilians killed in the airstrikes. The coalition conducted 29,254 airstrikes between August 2014 and the end of March 2018, the coalition said in a statement in April. A coalition review found the total number of civilian casualties during this period was 2,135. VOA's Nisan Ahmado contributed to this report.